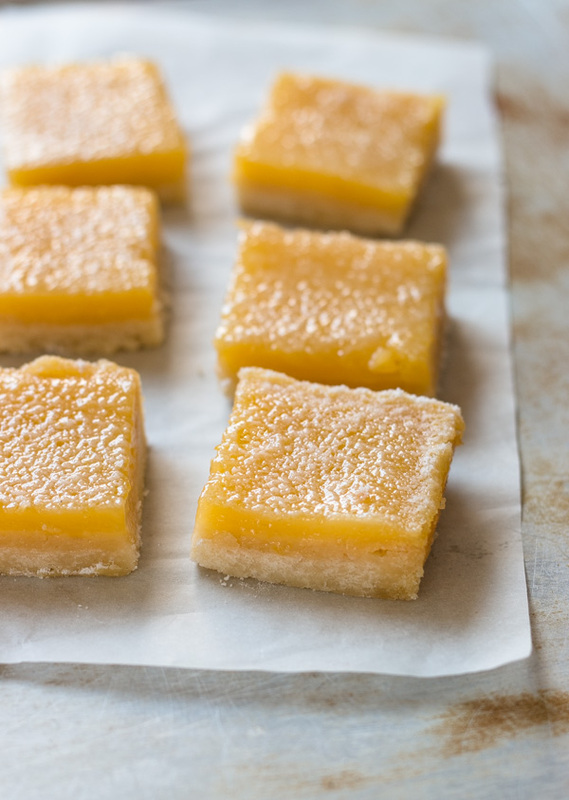 Lemon Bars | Pretty. Simple. Sweet. Classic creamy and tangy lemon bars with a sweet buttery shortbread crust. It’s been a long 6-month wait, but I finally got my wedding album! If you would have asked me a few years back if I believed I would find the man of my dreams and get married, I’d have said “No way!” You know what they say, though – eventually, it happens to all of us. The day of my wedding was the best day of my entire life. That’s crazy, isn’t it? Although I’m usually not the emotional type, just looking at the photos and reliving that day makes me want to burst into tears. We were so happy that day. To be honest with you, it doesn’t feel like we’re newly weds, rather as if we’ve been living together for 20 years. I mean that in a really good way, so don’t worry. But what was it I actually needed to talk about? Oh yea, lemon bars! So let’s talk about that. 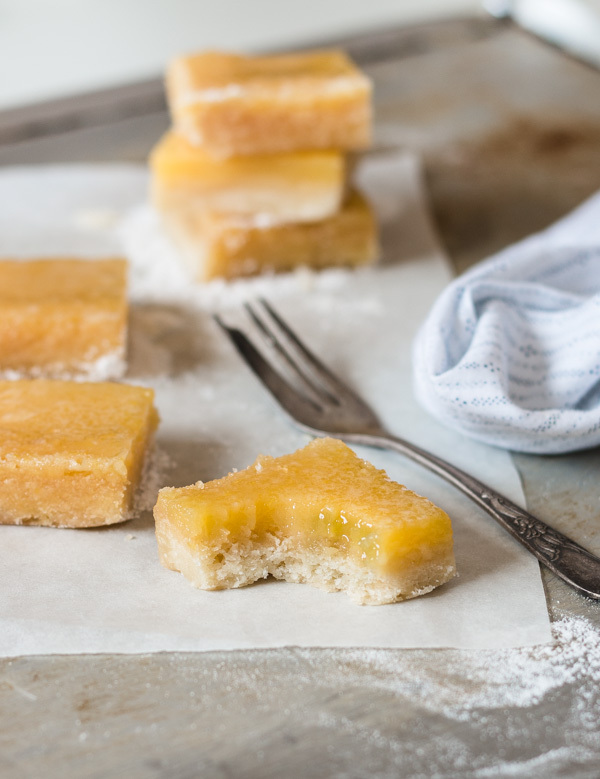 These are classic lemon bars with a sweet, buttery, tender crust and a creamy lemon filling. Every bite is sweet, tangy, and refreshing. It literally melts in your mouth. Recipes for classic lemon bars usually consist of a shortbread crust. The sugar used in the crust can be either granulated or powdered sugar, although the latter adds a more tender, melt-in your-mouth texture. Similar to my melt-in-your-mouth cookies recipe, 1/4 cup of the flour in the crust can be replaced with 1/4 cup cornstarch for an even better texture. Pre-baking the crust, such as in tart recipes, is necessary in order to prevent sogginess. Lemon fillings vary in the amount of zest and juice used in the recipe. These bars have a nice, strong lemon flavor. You can even use more lemon zest if you like. Flour, in addition to eggs, is added to thicken the filling. I like to reduce the amount of sugar in my recipes if possible. I find this recipe sweet enough for my tastes, but you can taste-test the filling and add more sugar if desired. Add up to 1/2 cup more (just to the filling, not the crust). 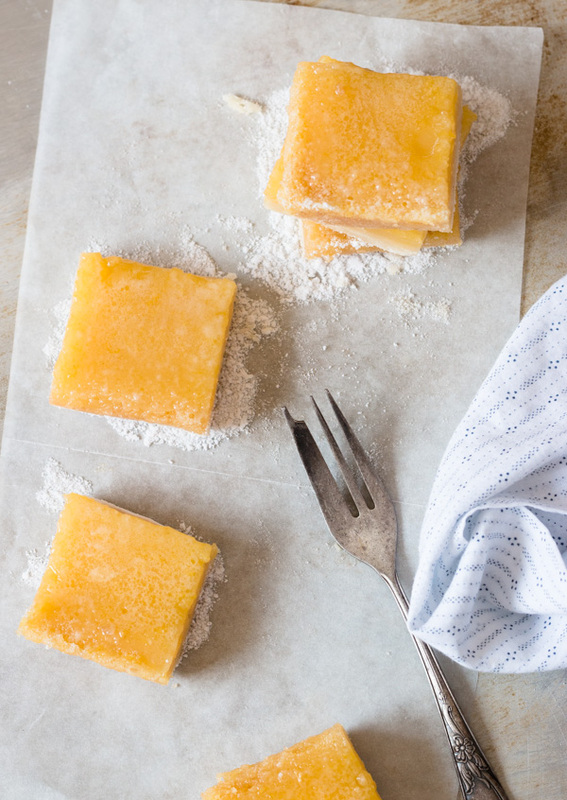 Serving the lemon bars on the same day as baking is best – that’s when the crust is still crisp. By the second day, the crust will begin to soften slightly, but the bars will still keep in the fridge for 3 days. Note: The filling should be poured on a warm crust, so make sure that by the time the crust is warm, the filling is ready. Preheat oven to 350F/180C degrees. Grease or line a 9×13-inch pan with parchment paper or foil, leaving enough overhang on the sides for lifting the bars out of the pan after baking. Set aside. To make the shortbread crust: Process flour and sugar in a food processor until combined. Add butter and pulse until mixture becomes crumbly and resembles coarse meal. Alternatively, you can crumble all the ingredients together in a bowl using a pastry cutter. Sprinkle mixture into prepared pan and press firmly into an even layer. Bake for about 20 minutes, until the edges are slightly browned. Allow to cool on a wire rack just until warm, meanwhile make the filling. Reduce oven temperature to 325F/160C degrees. To make the filling: In a large bowl, whisk together eggs and sugar until combined. Add lemon juice and zest and whisk to combine. Add flour and whisk until smooth. Pour into warm crust. Bake for about 20 minutes, just until set and filling feels slightly firm to the touch. Allow to cool completely on a wire rack in room temperature, then refrigerate for at least 2 hours or until completely set. Then, lift the bars out of the pan using the parchment paper and cut into squares. Dust with powdered sugar. *1/2 cup of granulated sugar can be replaced with powdered sugar. Powdered sugar results in a more tender crust. -Bars are best the same day they are made (the crust will slightly soften after that), but will keep 3 days in the refrigerator. -You can half the recipe and use an 8x8-inch pan. 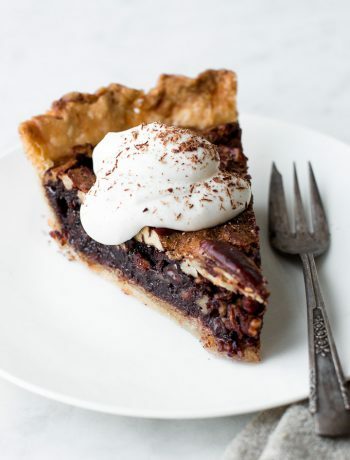 Bake crust for about 15 minutes, then bake bars with the filling for 17-20 minutes. I am a sucker for all things LEMON! These bars look incredible. These look gorgeous. 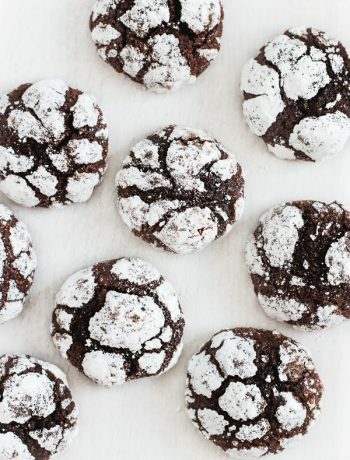 Im going to have to try your melt-in-your-mouth cookie recipe too! 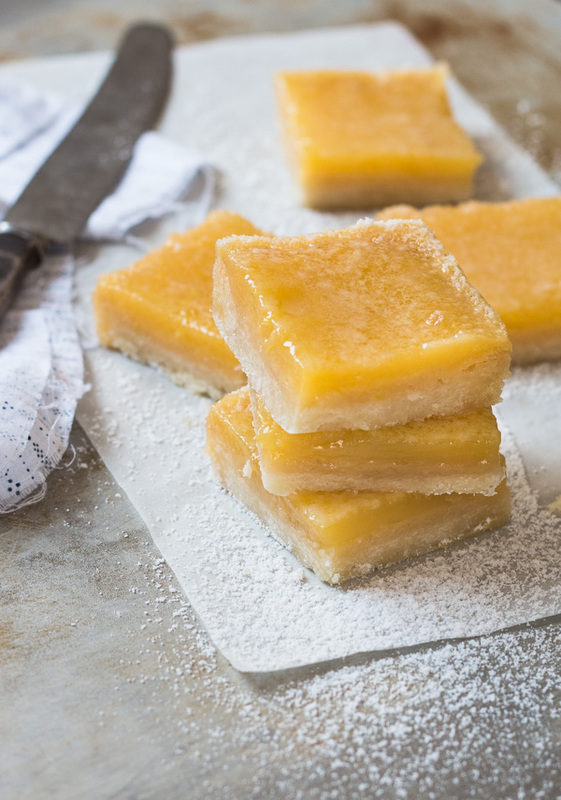 pretty cute lemon bars, nice pictures. My dad loves lemon bars and I decided to make these for his birthday. He loved them and make them every time I visit him. No offense but mine are tarter and more lemony…??? Interesting recipe! May I know how long should I whisk the egg with sugar? I tried the recipe but the end result smell very eggy and not as yellow as your pictures showed. Wonder which step has gone wrong? Hi Ashley 🙂 There’s no need to whisk the eggs for a long time. I whisk them with the sugar until well combined. The color may be a bit different due to editing/camera (although not extremely so). Unfortunately it’s hard to tell which step went wrong since there are many things that could happen, but I hope it would turn out better next time! Hi Shiran! 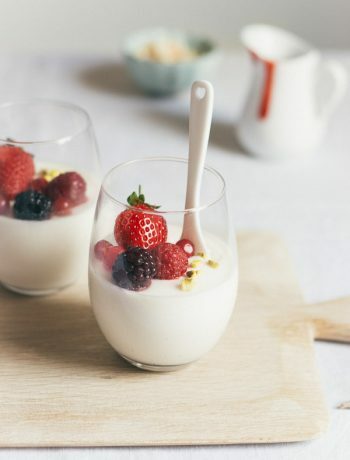 This recipe is indeed delicious! I was pleasantly surprized that the recipe I have been using for years is almost the same, except I add 1 tsp of baking powder. Every time I make it, I get lots of compliments! Just wanted to point out that 1 1/2 cups of granulated sugar is 300g, not 150g. Keep up the yummy recipes! Thank you so much for the recipe! I had to add maybe 50 more grams of flour to my dough and a little more to the lemon layer as well just because I was worried it’s not going to set. Other than that the flavor is amazing and the crust is so buttery and satisfying!